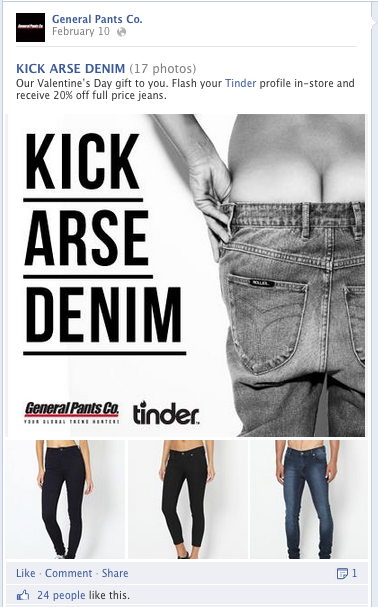 General Pants has leveraged popular dating app Tinder for its latest advertising campaign, using the app’s messaging feature to send a push notification inviting users to ‘get in my pants’. The clothing retailer is one of the first advertisers in Australia to adopt Tinder as an advertising platform and is using the activity to drive traffic to its stores and is offering 20% to any customer who shows their Tinder profile. Like most social apps, Tinder is in the first throes of trying to generate revenue from its quickly increasing user base. Over in the US the app has formed a number of ‘strategic partnerships’ with TV shows like The Mindy Project and Suits.